Although she has only been on the job for a few weeks, Houlton’s new town manager already has fallen in love with the community. HOULTON, Maine — Although she has only been on the job for a few weeks, Houlton’s new town manager already has fallen in love with the community. 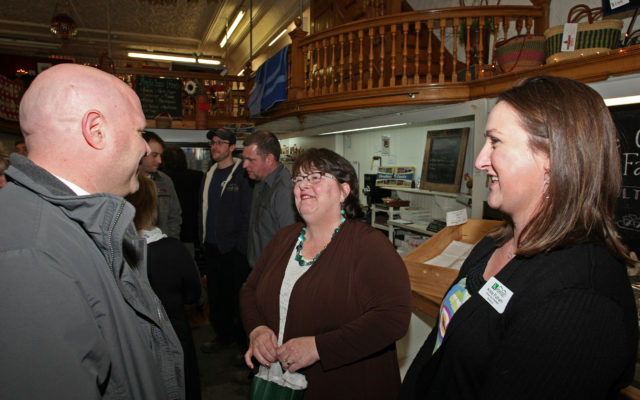 Town officials organized a meet-and-greet social event Wednesday, March 13, at the County Co-Op and Farm Store in downtown Houlton to introduce residents to Marian Anderson, the town’s newest manager. A group of about 50 people attended the event. Anderson was one of 21 candidates who applied for the post. She graduated from the Edmund S. Muskie School of Public Service and Municipal Leadership and is a licensed tax assessor. She also has experience in code enforcement and has written federal grants. Prior to her tenure in Wiscasset, she had spent five years as town manager in Richmond. Anderson was Wiscasset’s longest tenured town manager, having served in that capacity since 2014. In Houlton, she replaced William MacDonald, who abruptly resigned from the post Sept. 4, less than nine months into the job. Previously, Anderson said one of the first things she was going to do was buy a big shovel or snowmobile to enjoy all of the snow in the Shiretown. Anderson added that she knew she made the right decision to come to Houlton when complete strangers came forward and offered to help move her belongings into her new home, once that home is purchased. The vast amount of snow found in Aroostook County only furthered her excitement about moving to Houlton. In her first month on the job, Anderson said she has heard from a lot of different community members, particularly at the twice-monthly town council meetings on a number of different issues.